"Great, Great Grandpa Apell had a huge farm in Illinois with prize-winning corn. He made Popcorn Balls for all the Grandkids at Christmastime. He lived to be 106 and claimed workin' the farm and eatin' corn was the secret! This recipe is delicious!" In a saucepan over medium heat, combine the sugar, corn syrup, butter and water. Stir and heat to hard-crack stage or 300 degrees F (150 degrees C). Remove from heat, add vanilla or vinegar; mix well. Pour slowly over popped popcorn while stirring. Wait 5 minutes and shape into 3 inch round balls. 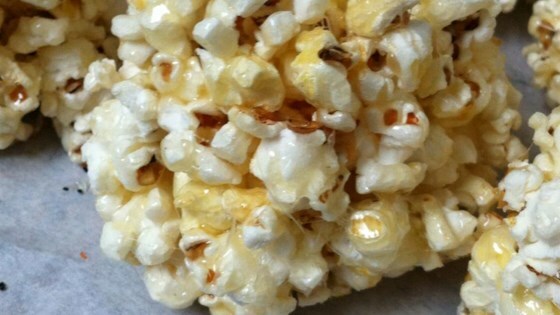 Kids of ALL AGES love these popcorn balls. Don't be thrown by the 1/2 cup of popcorn, that is the measurement for unpopped corn. Makes just the right amount!